It was just yesterday that we brought you news that Jodorowsky's Dune, the documentary about the legendary making-of a movie that never happened, was currently filming around the globe right now. Today, we're happy to present you with this exclusive video clip from the upcoming production. What do you think? Are you as excited at learning more about this fever dream of a film as I am? 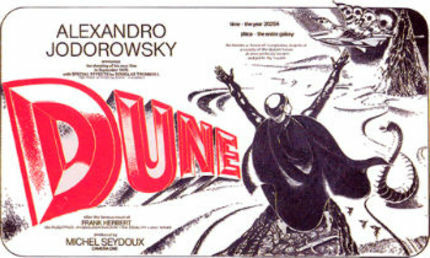 It was announced today that L.A. based Snowfort Pictures, Camera One of France and Koch Media of Germany have begun production on Frank Pavich's sci-fi documentary JODOROWSKY'S DUNE. Shooting has wrapped in France, Switzerland and the U.K. with filming to continue this summer in the United States. Picture will be completed by late fall. With interviews completed with Alejandro Jodorowsky, H.R. Giger, Dan Foss, Michel Seydoux, and the surviving original team, the production heads to the U.S. to conduct interviews with industry executives, filmmakers and film critics to put the film into perspective. I have arrived. Now I must change my pants. Watching this documentary is going to be like listening to Adriana Lima talk about showing you the night of your life for an hour before throwing you out of the hotel room. Such a tease. Someone give this man money to direct again! It's weird: I could have sworn he was attached to some new project, but I can't remember what it was. Jodo seems like the perfect director for the online film age. His work--all about feeling and images--would work perfectly in 3-5 minutes chunks. I want that book he's looking through. Wouldn't it be nice if the online community offered to collectively fund Jodorowsky's newest project, which from what I've been able to glean is in limbo yet again? King Shot or Sons of El Topo? Yes, please. I'll pledge $500 right now.